QRILL Pet is just such an ingredient. However QRILL Pet is unique in that it fulfills pets' nutritional needs along with providing a number of health benefits in one single ingredient. Essential omega-3 fatty acids are important for the ideal pet diet. They have shown health benefits for pets, including healthy organs, skin, and fur. Pets are unable to produce omega-3s themselves and need to get this vital fatty acid through their diet. More and more pet owners are aware about this need and adding this unique omega-3 source to your pet food, will provide a competitive advantage in a saturated market. However, not all omega-3s are the same. Most common pet food products use fish oil, where the omega-3 fatty acids are in form of triglycerides. QRILL Pet is made out of whole dried Antarctic Krill, a species rich in phospholipid omega-3s. An important distinction, a study done by Aker BioMarine showed that the body takes up phospholipid omega-3s faster than triglyceride omega-3s. One of the most important part of pet foods are proteins. Proteins are needed for growth and maintenance of muscles and cells.Today, the most commonly used proteins in pet foods is chicken. However, the pet food industry is aware that the needs of the pet food market cannot continue to be sustainably met with chicken and is looking for alternative sources. Krill is rich in highly palatable and digestible marine proteins. QRILL Pet consists of almost 60% proteins, helping to ensure pet food has a complete and highly digestible amino acid profile for dogs and cats. QRILL Pet serves as an additional protein source in pet food and can help to replace some parts of other protein sources commonly used. Antioxidants are powerful compounds that are crucial for pets to fight off the harmful effects of free-radical oxidation and keep their cells healthy. The astaxanthin in QRILL Pet is a natural antioxidant that protects the omega-3 fatty acids from oxidation, keeping them naturally fresh and stable over time. Additionally, astaxanthin has been associated with many different health benefits, such as improving immune system function, supporting brain health and cognitive function, helping cardiovascular health, having skin-protective effects and suppressing bacterial infection. Choline is another essential nutrient that pets require for optimal health. Choline is the head-group of the phosphatidylcholines molecule and is a natural component in Qrill Pet. The vitamin-like nutrient plays multiple physiological roles and is important for muscle function, memory, methylation reactions and liver lipid transport. A study showed that dogs on a Qrill Pet diet had their choline levels raised by 52% after only 6 weeks. As the human population is growing, so is the pet population. Naturally, this will result in a growing demand for pet food which brings challenges in choosing sustainable ingredients. This is why it is particularly important to protect our oceans and ecosystems by selecting ingredients from a marine feed that is sourced from a sustainable fishery. 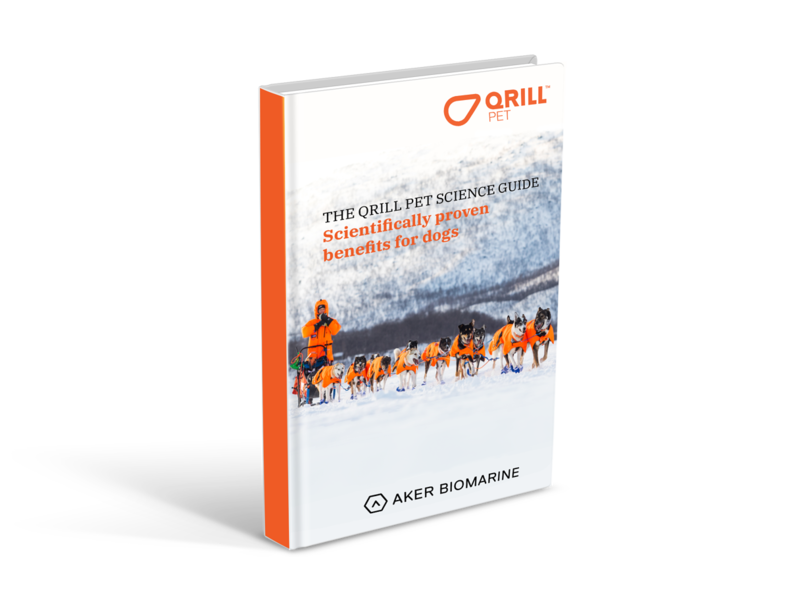 Antarctic krill, as used in Qrill Pet, is considered as one of the most environmentally sound marine sources. QRILL Pet is also the only Antarctic krill ingredient that is certified by the Marine Steward Council (MSC). Palatability of pet food is typically measured using a single-bowl, or a two-bowl test. It is of course a very important facet of pet food and even more so for premium pet foods. Obviously if a food is not palatable, pets will not eat it, regardless of the food’s nutritional components. The marine proteins in QRILL Pet make them highly palatable for pets. In a study where 18 dogs were introduced to pet food containing Qrill Pet, 17 of them choose the food containing Qrill Pet over the one without krill. A dog is presented with two food choices: A regular diet or a new formulation with krill inside. Which one will she choose? Watch the video to see the results.